Greeting | Sankosha Co., Ltd.
From our beginning, we have succeeded by “developing and selling products that will support the laundry and dry cleaning industry.” We will do our best to change in this global era by creating an operation base overseas. In 1975 when our founder was 41 years old, he started product development in the garage next to his house using his own experiences as a dry cleaner. This is the origin of Sankosha. Due to his lack of experience and knowledge of machine production as well as a limited source of funds to ask someone who could help him, he built up his knowledge by his own ideas and creativity. He faced a lot of difficulties but he said to himself, “No one is a specialist from the beginning”, and he never gave up. As a result, he successfully released the first shirt pressing machine ever in Japan at his first plant in Hachioji in 1977. It was a big hit at the domestic trade show and the industry began to pay attention to Sankosha. 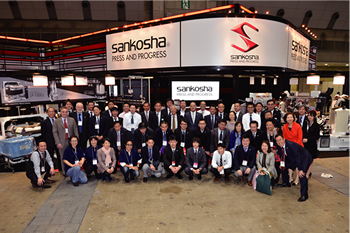 Thanks to wonderful distributors, Sankosha was able to create a solid distribution network nationwide. In addition, Sankosha started doing business abroad joining the exhibition in UK in 1988, establishing a branch in Chicago, Illinois in 1993, and has developed a highly successful overseas market. 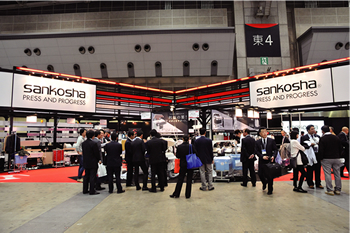 Sankosha has become an export oriented company with its sales overseas being larger than those in Japan. We can say that our business model was to develop and produce machines in Japan and sell overseas. Sankosha had grown by selling commercial shirts pressing and bagging machines since then and we celebrated our company’s 30th anniversary in April, 2008. However, the Lehman Shock followed in autumn in 2008, and it forced us to change our business model. The management and associates both went through challenging times and the business significantly decreased. Under those circumstances, we established Sankosha (Thailand) Co., Ltd. We also reached an OEM agreement with a Chinese corporation. Our business model turned to be product development in Japan, production in Thailand and China, and selling our products overseas. When the new business model started, a new government took power in Japan and the foreign currency exchange rate turned to be favorable to the Japanese Yen. Our business also hit bottom and started to grow again. During this period, Sankosha Film & Supply completed its management restructuring and its business improved too. There appear to be some signs that we are now in a good business cycle. Our Thailand factory obtained ISO (International Organization for Standardization), and their product quality is constantly improving. This means that we have to recognize that Japan’s product quality is not Number 1 anymore. In the North American market, the core target customer segment has been changing. The weak yen is favorable in terms of exporting from Japan. In the meantime, it will be adversely working if you have to import raw materials from abroad. There will be some uncertainty especially after an expected special economic boom toward the Tokyo Olympics 2020 is over in Japan. The Chinese economy will also be a key for the sustainable global economy. In the age of uncertainty as described above, we will need to change by ourselves having the sense of urgency. Conducting corporate in-house training and seminars and creating the corporate culture to work together as a team for both product development and work efficiency will be keys for our future success. Mr. & Mrs. Founder have retired and Sankosha Holdings was established. Management has been taken over by the second generation. The process of separating the founder family from corporate management has just begun and will continue for the next ten years. By establishing the production base in part of Asia where half of the world population lives, we have taken a strong forward looking position. In the year 2017 when Sankosha celebrates its 40th anniversary our goal is to be prepared for another 100 years of conducting a highly successful business.